It's strange, some weeks I feel we have done very little. We don't seem to have been anywhere or had any trips out and then I look through the photos to put in our journal. I have too many and have to make choices and realise we have actually been very busy. Grandad is now driving and walking so much better. We can take short trips to places that were out of bounds without him as they were too far to walk or not on a bus route. It has rained all week and it has been difficult to get out. We saw a break in the rain and went to Roath Park. It has gardens, a lake and a playground. Bear was upset that I hadn't taken his bike. I told him I had forgotten but in truth I didn't fancy running around the park after him. He was OK after a moment or two and his face lit up when he saw the playground through the trees. He played on everything, including the climbing frame. 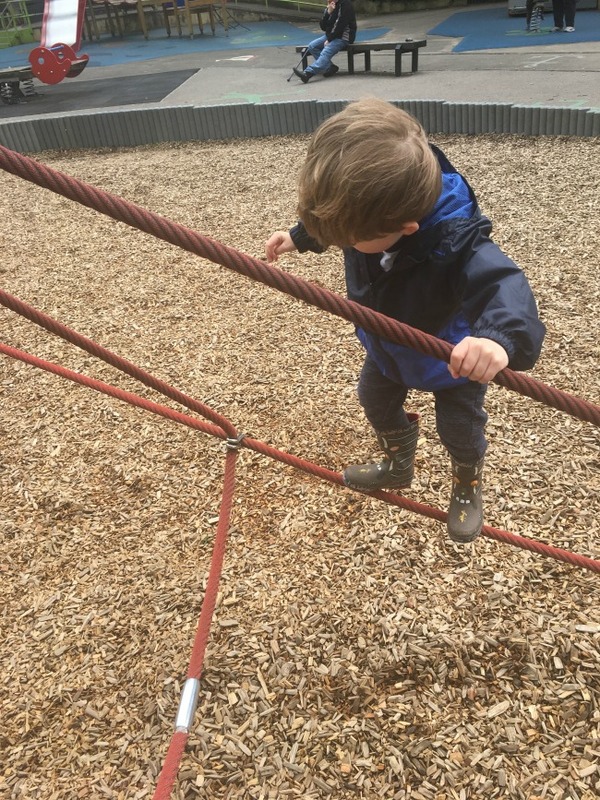 His balance and confidence is greater than his height so he can only reach the bottom ropes, but he was very pleased with himself. 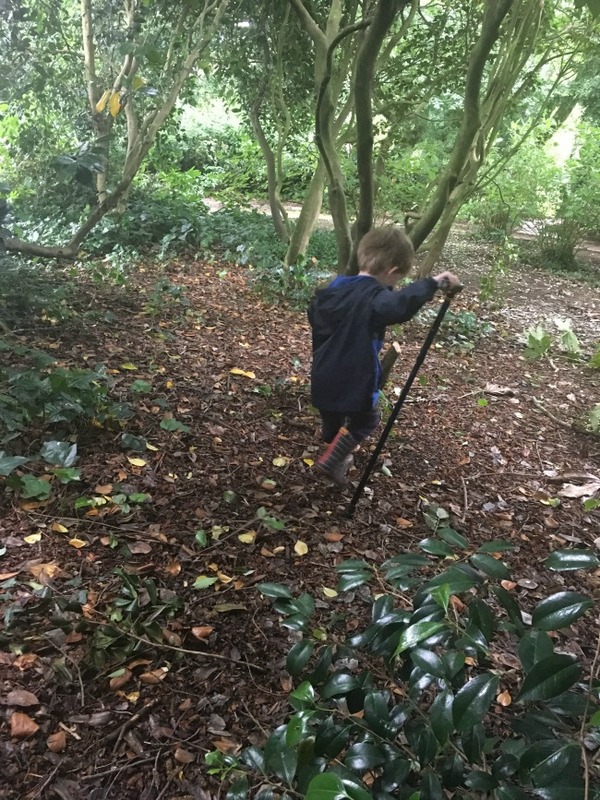 He has hijacked Grandads stick and is exploring the woods. He is two, three in October. That means he has a wicked sense of humour, he knows exactly what he wants and can express himself. He is saying so many funny things that I really should write them down as I forget so quickly. He was having a drink and told me the squash goes inside. Past his belly button and down his legs to his toes. We went shopping and Bear likes to hold the shopping list and cross off the items as we put them in the trolley. For the last two times he has sat in the trolley too, I do not know why, we had tantrums a while ago as he flatly refused to sit in one. Toddlers are complete mystery to me. Anyway back to the list. 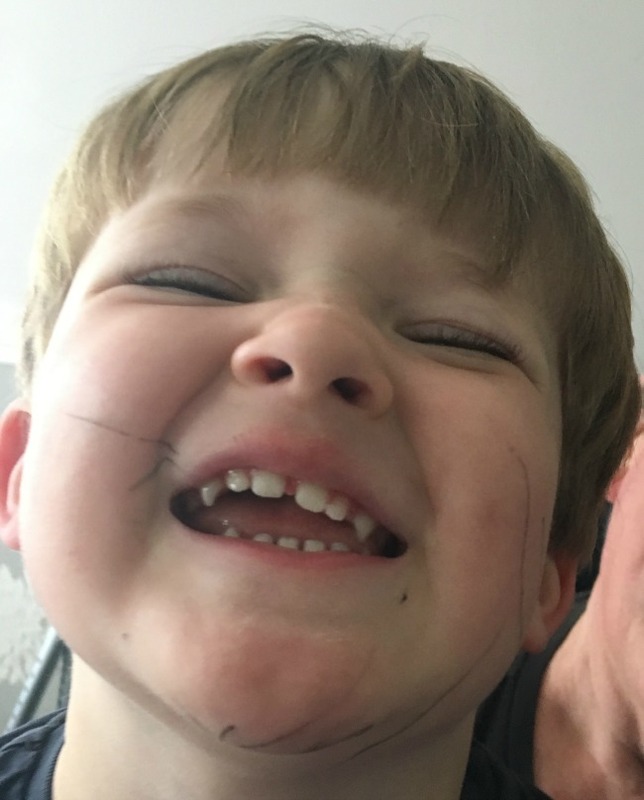 I gave him the pen and he was writing on the paper when he accidentally drew on his chin. Stupidly I mentioned this, which meant he drew more and more, giggling as he did it. 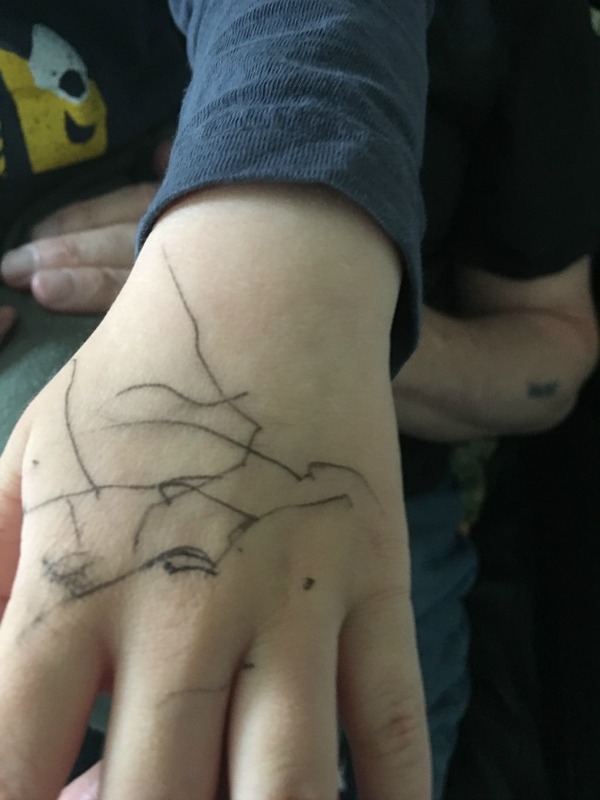 Then he drew on his hand. he thought it was so funny. On wednesday we went back to Tots club, the first time in over 6 weeks. 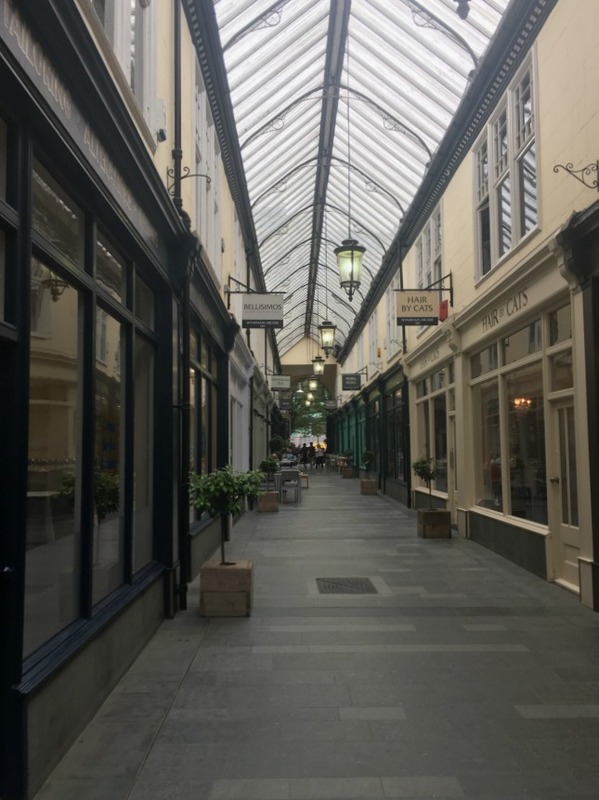 It is only a ten minute drive away but down a busy lane so walking isn't an option, and no direct buses. At a guess it would take at least an hour and a half to get there by bus. So while Grandad hasn't been driving we haven't been going. 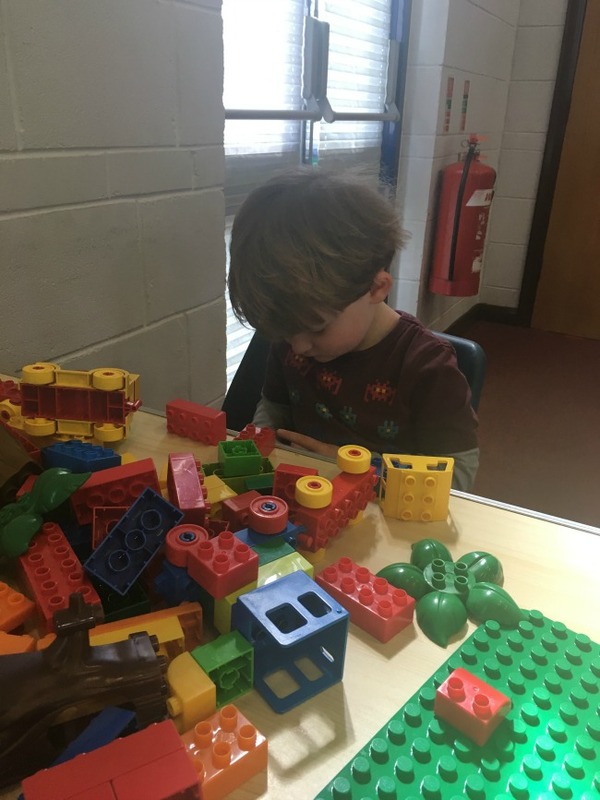 Bear played nicely with the Duplo, even when another child sat with him and took what he considers his toys. Then he joined in the singing. Suddenly he looked at me and shouted "don't look at me Nanny!" and lay down. Then he burst into tears. I have no idea what upset him, it was totally out of character although he has been saying that a lot to me lately. It is usually when he is doing some thing he knows I disapprove of. He was fine after a cuddle and two biscuits though. Thursday is bin day and we were in the bedroom when the first lorry came. I put Bear on the window sill so he could watch them work. Once the lorry had gone he noticed my jewellery box. I have one full of costume jewellery. 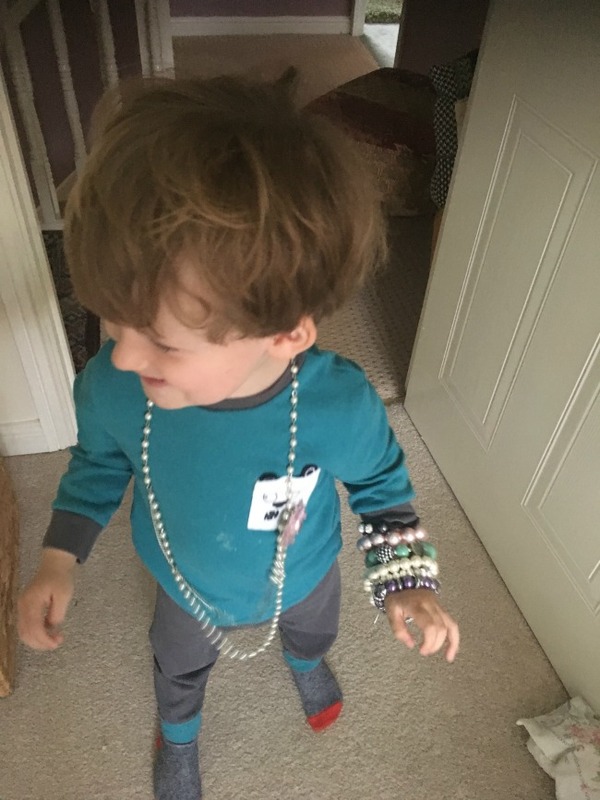 He loved trying on all the necklaces and bracelets. I think I need a dressing up box now. 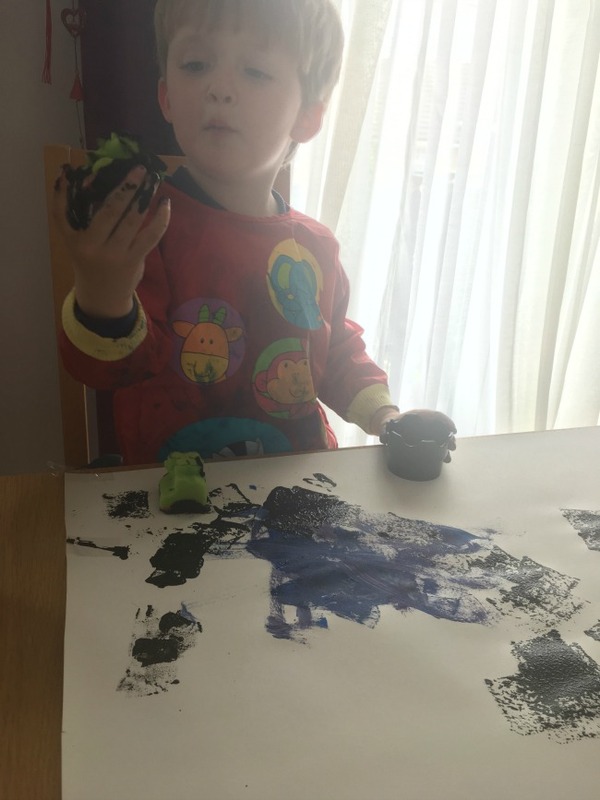 I usually enjoy messy play, especially messy painting but this week it just stressed me enough to write about it. If you fancy something a little light hearted have a look at It's Called Messy Play For A Reason. I now understand why some people dislike it so much. 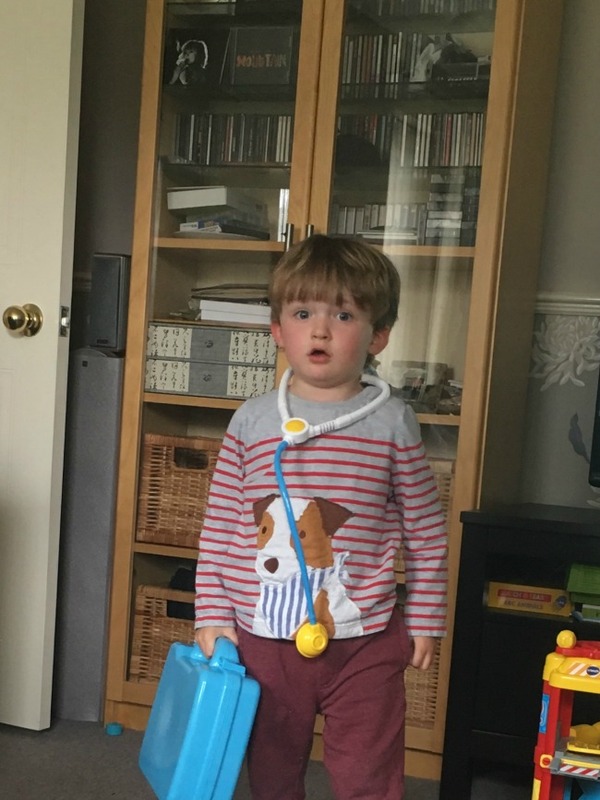 Bear had found an old retractable tape measure and was putting it onto Grandads chest saying he was a doctor and was listening to his heart beat so when we went to Asda I bought him a doctors set. Inside was an auroscope (for looking in ears) and a mirror for looking in mouths. I decided straight away I wouldn't tell him exactly what they were as I didn't want things poked into my ears or down my throat. The only problem was I forget to tell Grandad. I could hear Bear say "Ear wax, let me see for ear wax"
"The bike has had an accident. 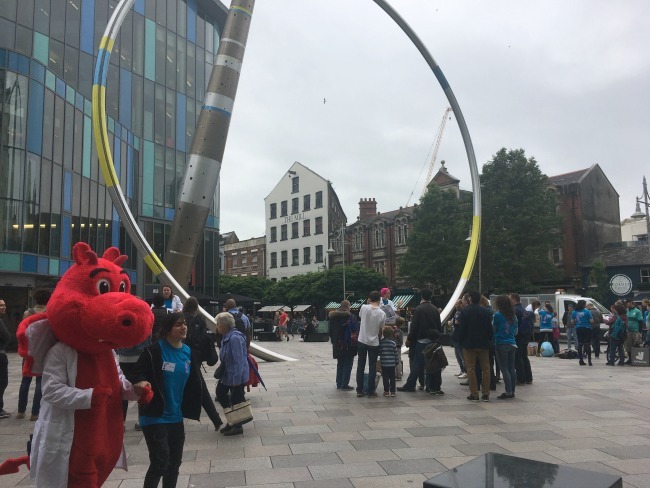 Check for ear wax"
On Saturday we popped into town for lunch. I had an average baked potato but the coffee was excellent and we walked miles. Grandads hip is so much better that we are now talking about walking in the mountains again. I can't wait, I miss the mountains so much. 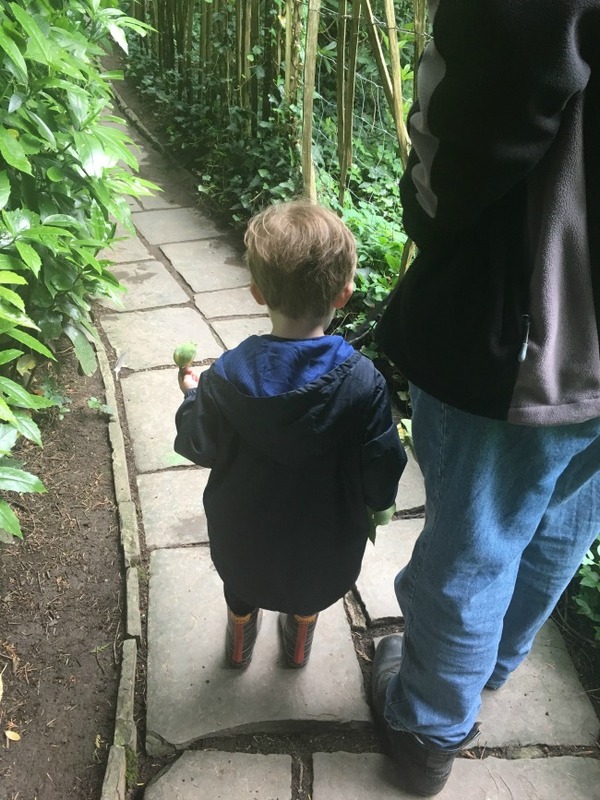 On Monday Grandad has his hospital follow up appointment and on Thursday Bear and I have been invited to sample the Summer menu at Benugo, in John Lewis. Their food is delicious so I know we won't be disappointed and I get the chance to meet up with some friends. I hope you had a good weekend and that the sun comes back this week. It's summer! Come on sun! Bear seems like such a character...He is just adorable.